The great shape-shifting mage Atrix Wolfe created a death-dealing spell whose ravages occupy most of the book. Here he finally creates a counter-spell, ranging through all the aspects of his life. It’s also a passage that typifies why Patricia McKillip, for me, is a gratitude among fantasists. I like many fantasy writers, but few achieve permanent lighthouse status. A handful of small but telling oeuvres, Sheri S. Tepper’s Gameworld books. Ellen Kushner, E. R. Edison. Samuel Delany. Joanna Russ. Tolkien, of course. Unlike Tolkien, McKillip’s work never radically altered my outlook or my writing style, but even now, I wish it could. McKillip, however, has been around a while. Her fantasy novels run almost uninterrupted from The Forgotten Beasts of Eld in 1974, up to The Bards of Bone Plain in 2010. Eld won the World Fantasy Award, but nothing since has missed a nomination or finalist position in some award, if not a win. From the passage above you can begin to see why. First and foremost, McKillip is the only fantasy writer I know who customarily operates at the rare level of language Tolkien himself only achieved every so often, as when, describing Cerin Amroth, he used the commonest words – “ gold, white, blue, green, tree, grass, flower” and yet drew with them “shapes that seemed at once clear cut, as if they had been first conceived” [that moment] “and ancient as if they had endured forever” (The Fellowship of the Ring, Book II Ch VI.) But in Atrix Wolfe here alone we have: “wind scented with honey, wolf, wildflowers,” “summer light cascading down stone”, “the tree smelling of sun-soaked pitch.” This passage is a major aria, so to speak, a cornucopia of life-images, but such examples appear everywhere. Simple words, often repeated, particularly words like “bone, wind, light.” Used mostly unadorned, but magnificently resonant. The language may be “simple.” The narratives are not. They deal with magic, and many shift between worlds, or between faerie and “earth” of some sort, or between then and now. Joanna Russ once wrote, “Harlequins say it over and over. I only say it once.” McKillip often doesn’t even say it once. The reader has to sit up and work, as we used to say about cutting-out horses, to figure how we got from There to Here and where Here might be, and if Here is a dream or not. The novels following Atrix Wolfe are particularly good at these “twitches.” In Winter Rose, the shifts from wood to farm, from past to present, and between the enchanted hero Corbet Lynn’s doubled –sometimes tripled – realities are as fast and can be as bewildering for the reader as they are for the characters. Was that a dream? Or an event? Or symbolism? 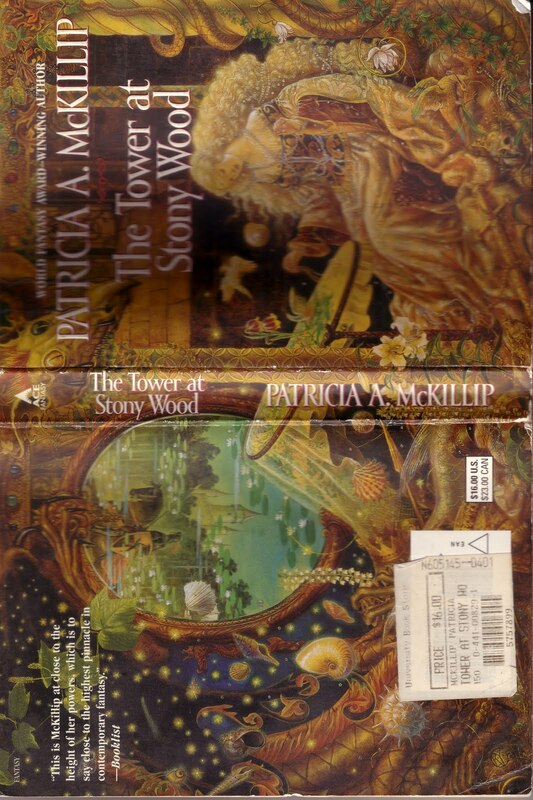 After 12 years and more than 12 readings for the similarly “shifty” The Tower at Stony Wood, I am just now firmly figuring out what happened where and when and to whom. This quality of enacting rather than just talking about interaction with other realities doubtless explains why McKillip doesn’t often appear on the popular awards lists like the Hugo. For McKillip, you are better to be one of those who, to borrow Huck Finn’s review of Pilgrims’ Progress, like their statements interesting but tough. There are other felicities peculiar to McKillip. Her characters are memorable and ever-differentiated, and they have charisma, yes, but Can Do Characters is only just up the writing pyramid from Can Spell and Can Tell a Story. 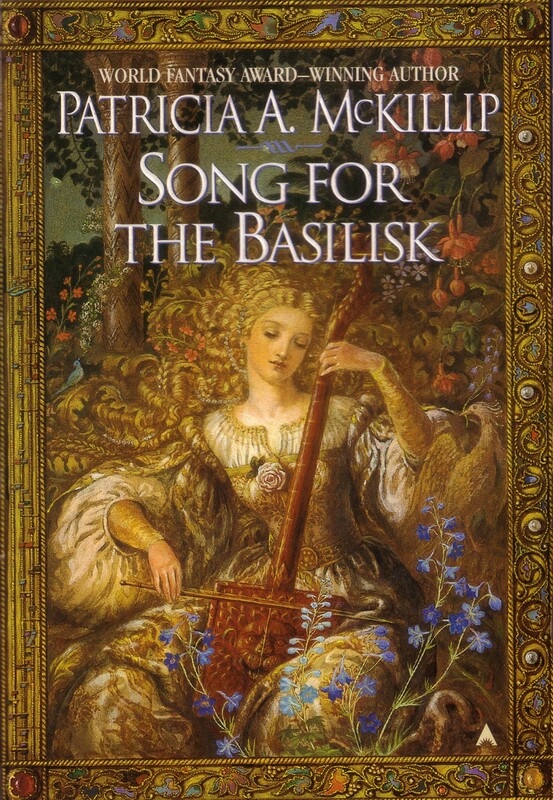 As might be expected, McKillip can also do beautiful settings and thunderous events, but she is one of the rare fantasists who draws music deeply into her work. Often music is integrated with magic, as in the Riddlemaster trilogy that ended with Harpist in the Wind. There, though, music leans rather towards hand-waving: Morgon strikes smashing notes from the harp, or he “plays the winds” or other such nebulous events. Later, music becomes more immediate. Here are musicians talking in the kitchen in Atrix Wolfe. “’Fanfares,’ they said, ‘first and second, and third, the one Lefeber wrote, and then, … with the second wine, the Silvan fanfare, which you always take too fast, and there is a rest between the second cadence –‘” (Ch. 7, p 84.) Magic has happened here, these musicians will sound for a king’s feast. But this is also the nitty-gritty of playlists and squabbles over timing you find among real musicians anywhere. Music provides the vehicle of magic in Song for the Basilisk and The Bards of Bone Plain too, but these books include some of McKillip’s more wicked invented instruments. The small, red-mouthed bone pipe Caladrius finds in the wild and with which he eventually destroys the Basilisk, is both eerie and imposing. But the music magister Giulia plays with a tavern group, using the “farmer’s instrument” the picochet. And then, a consummation not always to be found in notable fantasy writers, there are McKillip’s gender politics. Writing when second-wave feminism had already shown women writers how to change the masculinist narrative configurations of older fantasy, McKillip has no trouble making her women wizards, power-centers, decision-makers for the narrative, as well as heroines, victims and all the usual female roles. Even in Eld, wizardry is the woman’s power. Nyx in The Sorceress and the Cygnet is only one in the succession of such wizards, elemental powers, and even goddesses. Which raises my final cause for gratitude. Most high fantasy focuses on the nobility. 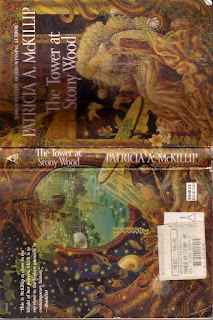 But in her best novels, McKillip doesn’t just turn a farmer-prince into a world-ruler; she can take a baker, and in Atrix Wolfe, an apparently mute scullery drudge, and transform them too into figures of magic and power. Best of all, she does it for women as well as men.